YOUTUBE | Manchester Blogger Fun! Today’s post is going to be rather short and sweet. (I know! Not like me to do a short post…) Back in January I created a list of things that I wanted to achieve that month. You can find that list here, perhaps for some inspiration for your own goals! In that list I stated that I wanted to get into the big wide world of Youtube more. That just didn’t happen in January….. or February… or March actually, life took over somehow! – but YESTERDAY I managed to upload a NEW Vlog, one I am actually really really proud of, I feel it is SUCH an improvement compared to my previous two vlogs. You can find my channel here. I met up with the lovely Rhianna at Leeds Train Station on Saturday morning. Train buddies! I was worried that I was running a little bit late, but I had plenty of time so I managed to grab myself a Starbucks, vanilla latte of course. We were UNBELIEVABLY lucky to grab ourselves a seat because the train was packed with people, with it being the grand national. After a few giggles, vlogging attempts and PLL discussions (the best kind of discussions) we had arrived in Manchester! It was my first time in Manchester, except inside either the airport or the train station, so I didn’t have a CLUE where we were…. We wondered around for a bit, a little lost, looking for the rest of the girls! We then found them running off a bus, I am SO PROUD I caught this on camera and AHH it was just so cute. *emotional* Love you girls! We were a little early for the market, so we found ourselves a little cafe, the staff were amazing – I wish I could remember the name of the place! I opted for a Strawberry Laces Tea (I don’ like tea, and it was yum) The teapots were also SO CUTE! Lots of giggles in this place. After spending £3.20 for my visit we went SHOPPING! Luckily we were very good and resisted most purchases! Even in Lush…. and the deadly BOOTS! But then…. we headed to a THREE STOREY Paperchase – pure stationary heaven! 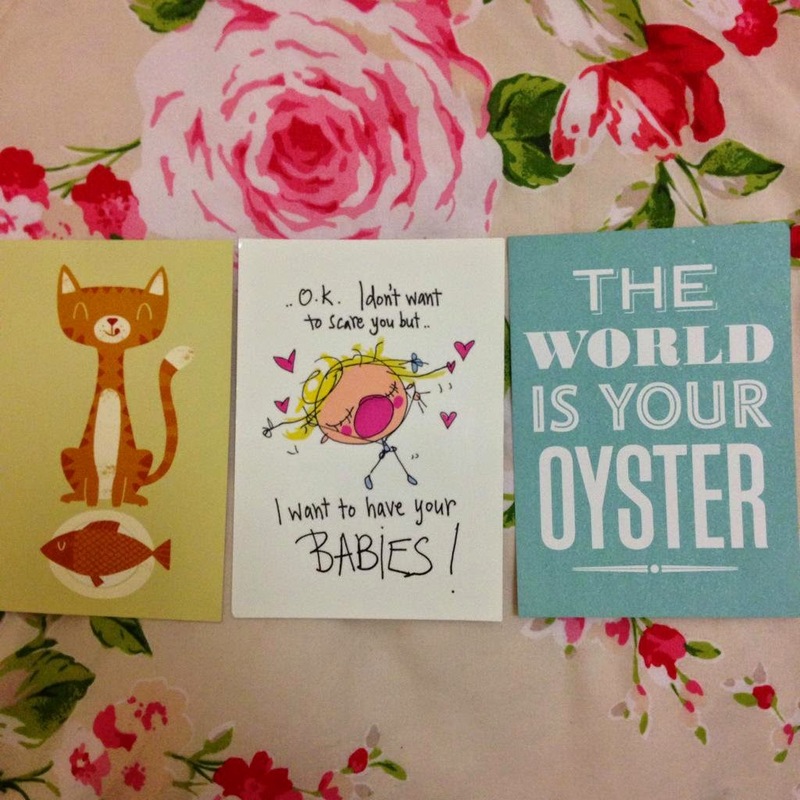 I picked up these lovely postcards – I LOVE paperchase postcards, they are humorous, witty, or motivational. I like to put them on my wall 🙂 We stopped in the Paperchase cafe for an hour or so, who knew you could get a cafe in Paperchase?! I had a delicious smoothie, I would call it Very Berry Cosmo. After a group decision, with our hungry bellies talking, we decided to go to TGI’s! YUM. I haven’t had a TGI’s in so long, and when the option was mentioned to go, I just couldn’t say no! Let me just point out…. this was the biggest TGI’s I have EVER seen! Wow! It was seriously impressive. Delicious meal and cocktails, again with lots of giggles! You can see this in my vlog below! You can find the girls here if you don’t have them already – Sophie, Laura, Emma, Rhianna. Hmm… wasn’t quite as short of a post as I thought! Opps! Thank you for reading this post lovelies, I hope you enjoy watching my vlog as much as I enjoyed filming it! Please do give my video a like, and perhaps give my channel a subscribe! (if you want to) I also welcome any feedback on my videos – always wanting to improve! I love this vlog so much, makes me giggle! Laura's bit is definitely my favourite. Such a lovely day and so nice to see you again lovely, hopefully not too long until we meet up again! aw this looked so fun, wish I could have been there <3 I honestly had a smile on my face throughout the whole video, that's what seeing your lovely faces does to me! cheap nike roshe run shoes Praise Road. nike roshe run australia Yang Wang cheap nike roshe run shoes Chaodong some proud chin and said, that is. cheap Arab East looked triumphant expression Thumbs commended nike roshe run sale road. Indeed the East Cape, really amazing. could cheap nike cheap nike roshe run shoes roshe run shoes not help but laughed a little proud of you do, give you a note, later to atone.